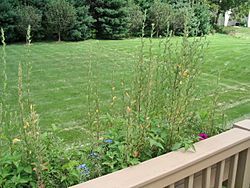 A lawn is an area of land planted with grass, and sometimes clover and other plants. 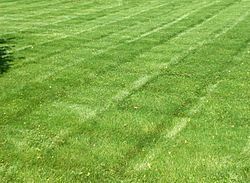 Lawns are cut to a low, even height using a lawnmower. Lawns are used for aesthetic (for their beauty) and recreational purposes. Other words used to describe them are turf, pitch, field or green may be used, depending on the sport and the continent. The earliest mention of lawns comes from France during the 1500s. Lawns (as opposed to fields) found their way to England in the 1700s. One acre of lawn would take three gardeners all day to mow using a tool called a scythe. Today a garden tractor mower with a 48" cut can mow an acre in less than an hour. 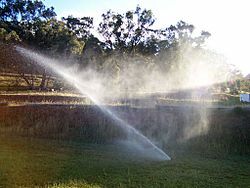 In many parts of the United States lawn care is an important part of home maintenance. a poorly kept up lawn can hurt the value of a home. Lawns are central to family activities. Neighborhood cookouts, birthday parties and playing outdoor games are just some of the uses. One of the most famous lawns in France surrounds the Eiffel Tower. It is part of the Champ de Mars. The south lawn of the White House is a world famous lawn in Washington, D.C.. The greens of Wimbledon, London where the Wimbledon Championships are played is the only major tennis tournament played on a grass court. Shinjuku Gyoen in Tokyo has large areas of lawns and gardens. It has some 1,500 cherry trees. The Lawn at the University of Virginia, facing south. The lawn of a small summerhouse. Gardens of the Château de Vaux-le-Vicomte, designed by André Le Nôtre at Versailles. 1803 painting of the main elements of the English landscape garden. The lawn at Kirkby Fleetham Hall, Yorkshire, circa 1889. The first petrol-powered lawnmower, 1902. 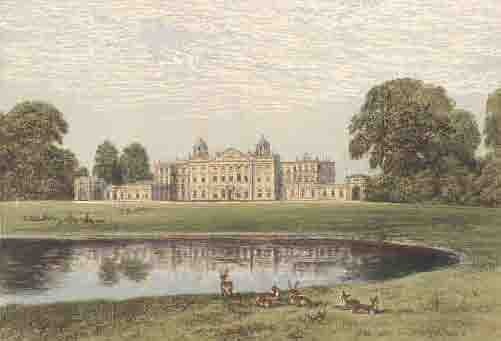 From the 1860s, the cultivation of lawns, especially for sports, became a middle-class obsession in England. 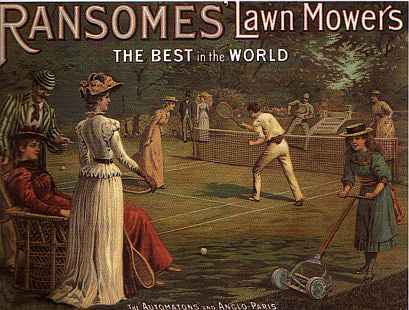 Pictured, a lawnmower advertisement from Ransomes. 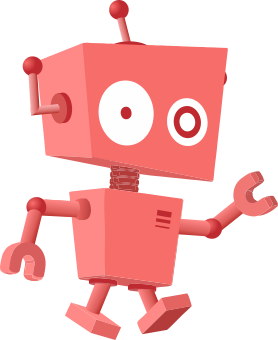 A typical lawn-mowing bot maintaining even and low grass. Capability Brown's landscape design at Badminton House. The area on the right has not been mown since the previous autumn. Lawn Facts for Kids. Kiddle Encyclopedia.